The spirit of "Atoms for peace"
ITER at IAEA Conference | The spirit of "Atoms for peace"
The General Conference of the International Atomic Energy Agency is among the largest and most diverse annual gatherings—more than 2500 participants from 153 countries—focused on nuclear science and technology. 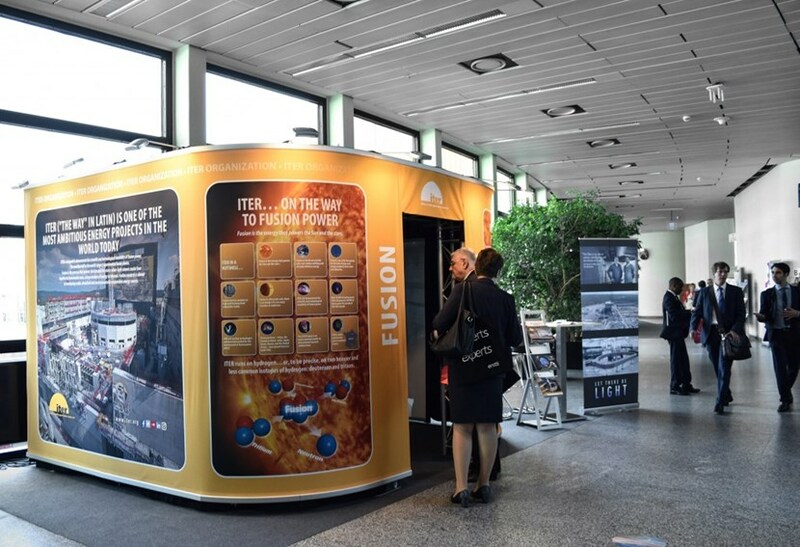 Last week, ITER was there as part of a collaborative focus on fusion energy. Hundreds of specialists and generalists, curious to learn more, spent time at the ITER exhibit: a small walk-in cinema where the latest drone videos showed overviews of the ITER worksite and the assembly and manufacturing ongoing inside major buildings. ITER Director-General Bernard Bigot was a featured speaker in the IAEA's Scientific Forum, entitled "Nuclear Technology for Climate Change: Mitigation, Monitoring and Adaptation." Speaking to the opening session on Tuesday, he highlighted the enormous potential of fusion energy, the challenges of constructing an industrial-scale fusion facility, and the progress and achievements of the ITER Project, including ground-breaking innovation by ITER Members and suppliers to keep the project on track for success. These themes resonated with the General Conference attendees. Hundreds of specialists and generalists, curious to learn more, spent time at the ITER exhibit: a small walk-in cinema where the latest drone videos showed overviews of the ITER worksite and the assembly and manufacturing ongoing inside major buildings. On Wednesday, the IAEA hosted an additional side event on "Fusion Energy for Peace and Sustainable Development." Meera Venkatesh, the Director of IAEA's Division of Physical and Chemical Sciences, hosted the event. In addition to Bernard Bigot, special guests included Sibylle Günter, the Scientific Director of the Max Planck Institute for Plasma Physics, and Mila Aung-Thwin, director of the award-winning documentary on the quest for fusion, Let There Be Light. Bigot offered a more detailed overview of ITER construction and manufacturing progress, and Günter presented the most recent results from Wendelstein 7-X and near-term operational plans. The event was heavily attended, with dozens of people standing throughout the presentations and Q&A session. Later in the morning, a sizable crowd stayed to watch the full documentary. The General Conference marked the end of a year-long celebration of the IAEA's 60th anniversary. As Director-General Bigot noted, in seeking to make ITER a model for international collaboration on complex science and technology challenges, the ITER Project is an embodiment of "Atoms for Peace."